Maldives Fish Field Guide "Top 200+"
The Maldives Fish Field Guide features the Top 200+ species of sharks, rays and fishes of the Maldives. A companion guide to the book Fishes of the Maldives, Indian Ocean. Includes a silhouette of each fish for easy identification, details including depth range, size, distribution, IUCN Red List status, page reference to the book and a checkbox for recording species. 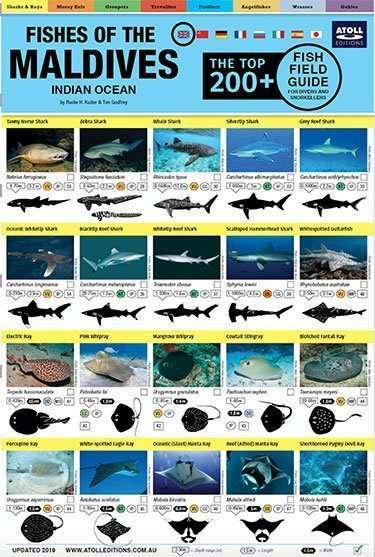 A quick fish identification guide for divers and snorkellers in the Maldives and wider Indian Ocean region. A perfect guide to check on those mystery fishes seen during dives. Symbols highlight points of interest and differences between similar species. The Fish Field Guide Maldives is compact, easy to use and is designed to assist in field work and conservation initiatives. Timothy J. Godfrey has been researching the atolls of the Maldives since 1986 when he started work as a dive instructor and guide on safari boats. He is also the author of the books Dive Maldives, Atlas of the Maldives and the Maldives Divers and Travellers Map. Rudie H. Kuiter started diving in 1964. He began drawing and photographing the various species, most of which were unknown at the time. He has published scientific papers on biology and descriptions of new taxa, and articles on seahorses, seadragons and other aquatic life have appeared in magazines around the world.